The Island Housing Trust works closely with island towns, architects, and builders when designing and building our homes and neighborhoods. Our goals are to acquire property that is close to workplaces, accessible by public transportation, within areas that have already been developed, and to use existing housing stock through renovations and house moves whenever possible. We try to minimize impact on the land, fit our house designs into existing neighborhoods, as well as model our scattered site developments on existing neighborhoods. While achieving affordability is a primary concern, we are also committed to Green Building Practices that lead to low maintenance and energy costs. Partnerships with the Martha’s Vineyard Land Bank, a leading land conservation organization, and the Trust have also realized the benefits of Conservation Based Affordable Housing. 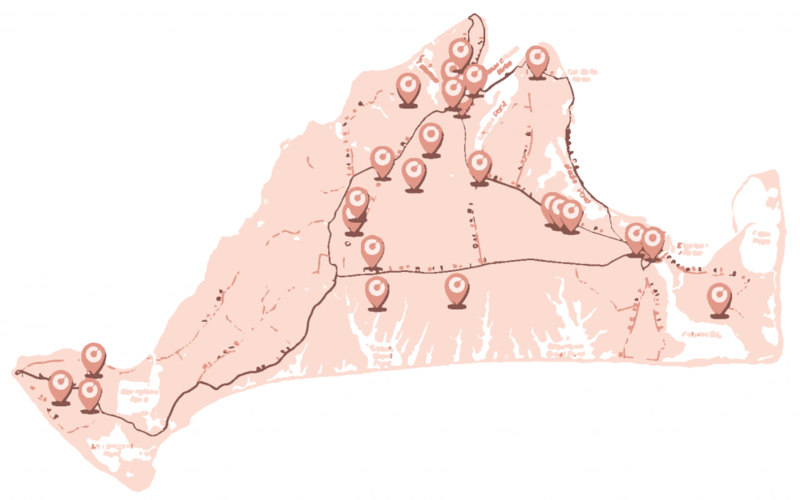 Click here to see an interactive map for a virtual tour of our many neighborhoods of homes and rental apartments across Martha’s Vineyard. 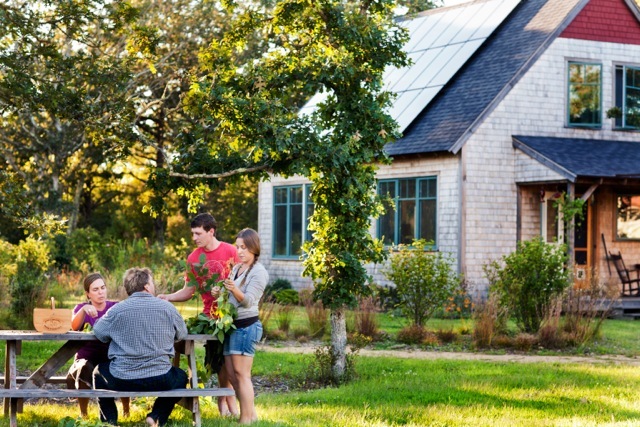 Over two dozen high performance homes designed and built over the past six years for the Island Housing Trust have achieved the highest green building certification in the country — LEED Platinum for Homes and/ or MassSave certifications, including a neighborhood of eight homes on Eliakims Way in West Tisbury, a neighborhood of four homes off Lamberts Cove Road in Tisbury, a neighborhood of three duplexes on Lake Street in Vineyard Haven, two homes on Harpoon Lane in West Tisbury, and three rental apartment off Clam Point Road. The idea to build affordable ownership homes on this six acre parcel of land in Aquinnah took a decade to become a reality. But, once ground was broken in December 2017, just 11 short months later two island families moved into these sweet, beautifully built, energy efficient, two bedroom homes. Helen Mays, a tribal member and long time former Aquinnah resident, sold the land, at a discounted price, to the town who then donated the land to the Island Housing Trust. 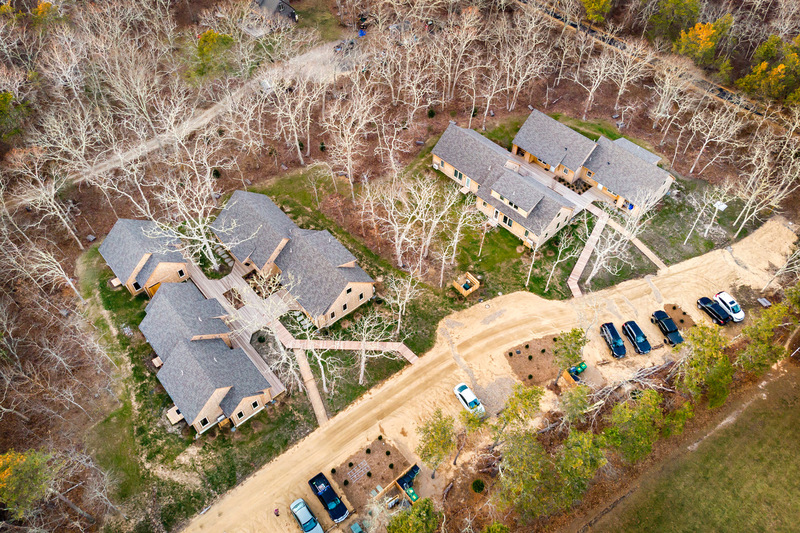 The trust partnered with the Martha’s Vineyard Land Bank to conserve four of the acres and built this “pocket” neighborhood on the remaining two. The topography of the land is typical of the rolling hills of Aquinnah and the community will be able to enjoy the property with wooded walking trails. The two families who purchased the homes each have a young child who will grow up close to one another and deeply connected to the roots of their community and its history. 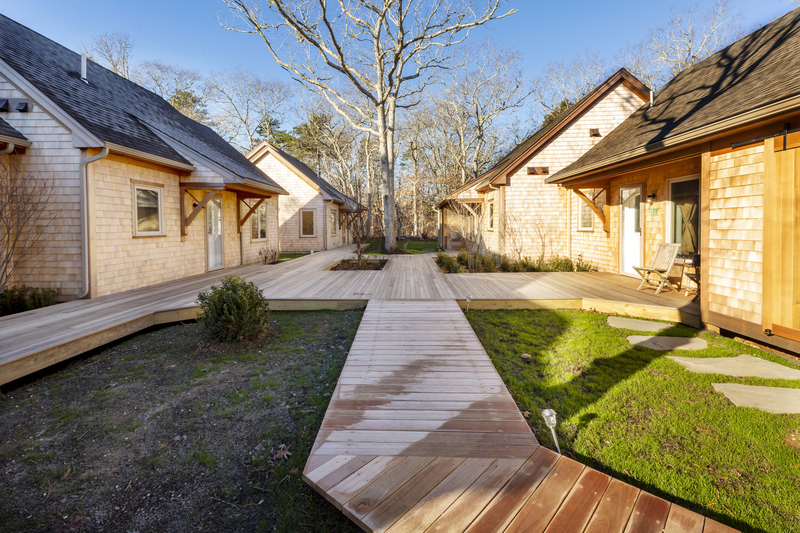 The nine, new, permanently affordable, year-round rental apartments at Scott’s Grove in West Tisbury are now home to twenty island residents. Completed in September 2018, with the help of dedicated town officials, architects, builders and generous donors we celebrated this milestone with a Ribbon Cutting ceremony. Everyone moved in on October 1, 2018, just eleven months after breaking ground, in plenty of time to celebrate the holidays. The four buildings were designed to fit perfectly on this lovely parcel and the use of connecting decks, with built in planters, helps create a sense of connectedness while still offering residents privacy. 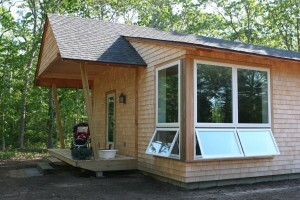 Each unit is filled with natural light, energy efficient and built to last. The IHT plans to utilize this successful design for upcoming projects on other parcels which lend themselves to building small communal enclaves. Six new one-bedroom apartments were completed in October of 2016 on land donated to the Island Housing Trust by Steve Bernier in downtown Vineyard Haven. The building design was developed through a competition with the goal of designing a building that complements the existing neighborhood and provides liveable, energy efficient, affordable in-town rental housing. Terrain Architects of Vineyard Haven was selected to complete the conceptual design and BrightBuilt Home of Portland was selected to complete the modular plan design. This in-town transit oriented apartment building serves low and very low income island residents with the greatest need. The Trust has contracted the Dukes County Regional Housing Authority to provide rental and property management services. Photographs can be view at Water Street photographs. In partnership with the Dukes County Regional Housing Authority the Island Housing Trust ground leased 1.5-acres to build three apartments that complements four existing apartments owned and managed by the DCRHA. The project upgraded the existing septic system and serve both the existing and new apartments resulting in less nitrogen loading into the Tisbury Great Pond. Both the existing and new apartments were designed by South Mountain Company of West Tisbury and the new apartments were built by DrewCove Builders of West Tisbury. This project was made possible with construction and permanent financing from the Edgartown National Bank, and grant funding from the Town of West Tisbury Community Preservation Act and the FHLB Boston Affordable Housing Program. Construction was completed in December 2014 and is being rented to low and very low-income island residents with the greatest need. The Trust has contracted the Dukes County Regional Housing Authority to provide rental and property management services. Photographs can be view at Sepiessa photographs. An existing six unit rental apartment building located within a neighborhood of similar multi-family buildings walking distance from the upper State Road commercial district in Vineyard Haven, was purchased by the Island Housing Trust in February of 2014. Working in partnership with The Resources Inc (TRI), Cape Light Compact, Low-Income Energy Affordability Network (LEAN), and Housing Assistance Corporation (HAC) extensive renovations were completed within 90-days to the exterior and interior of the building along with needed upgrades and energy efficiency measures to this 40 year old building. This apartment building was purchased and renovated with financing from the Edgartown National Bank , grant funding from the Community Preservation Act from four Island towns, including Tisbury, West Tisbury, Chilmark, and Edgartown, grant funding from the Federal Home Loan Bank (FHLB) of Boston, as well as contributions from our generous donors. The Trust has contracted the Dukes County Regional Housing Authority to provide rental and property management services. Photographs can be view at Village Court photographs. A small neighborhood of three single family houses was created through a private donation of land to the Island Housing Trust. A competition was held to find the most cost effective, high performance design and build proposal. South Mountain Company of West Tisbury’s M-Line house design was selected. 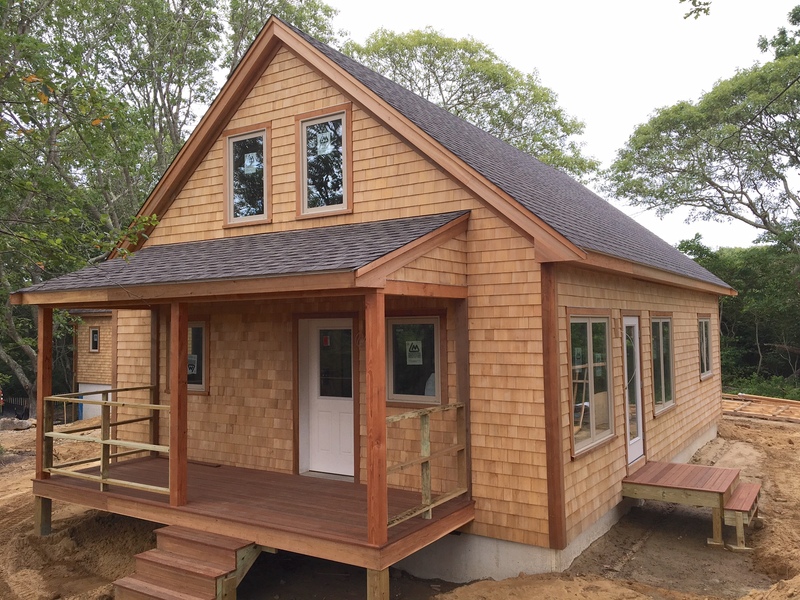 These three-bedroom houses were built with construction financing from the Edgartown National Bank and grant funding from the Town of West Tisbury Community Preservation Act and Housing Trust Fund. Construction was completed in May of 2013 and sold to income-qualified homebuyers earning 80% or less of the median income. The Trust worked with the Dukes County Regional Housing Authority and the Town of West Tisbury to conduct the homebuyer selection and lottery process. Photographs can be view at Harpoon Lane photographs. A public/ private partnership involving the Island Housing Trust who purchased a 1.38-acre parcel of land on Lake Street from the Town of Tisbury. The Tisbury Affordable Housing Committee secured a comprehensive permit to build a cluster of 6 townhouses (3 duplexes) walking distance from downtown Vineyard Haven. Each of the duplexes have been designed to the Trust’s high performance building standards (MassSave Tier III) to ensure maximum energy efficiency and long term affordability. 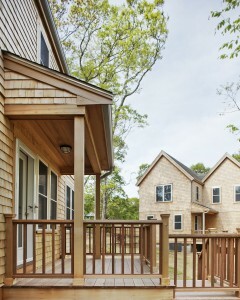 The duplexes were designed by Cohen Architects of West Tisbury and LDa Architecture and Interiors of Cambridge. Grants were secured from the Tisbury Community Preservation Act (CPA) to cover certain development costs. Construction financing was secured from the Edgartown National Bank. The first phase of construction (2 duplexes) was completed by Williams Construction Company of West Yarmouth in May of 2012 and the second phase (1 duplex) was completed by DrewsCove Builders of West Tisbury in May of 2013, and townhouses were sold to income-qualified homebuyers earning 80% and 100% or less of the median income. The Trust worked with the Dukes County Regional Housing Authority and the Tisbury Affordable Housing Committee to conduct the homebuyer selection and lottery process. Photographs can be view at Wentworth Way photographs. In a joint purchase with the Martha’s Vineyard Land Bank, the Island Housing Trust purchased an 8-acre parcel that was part of a larger 26.5-acre parcel in 2004. The Land Bank purchased 15.5-acres for conservation and passive recreation use, along with 4-acres of conservation restrictions from the Trust. 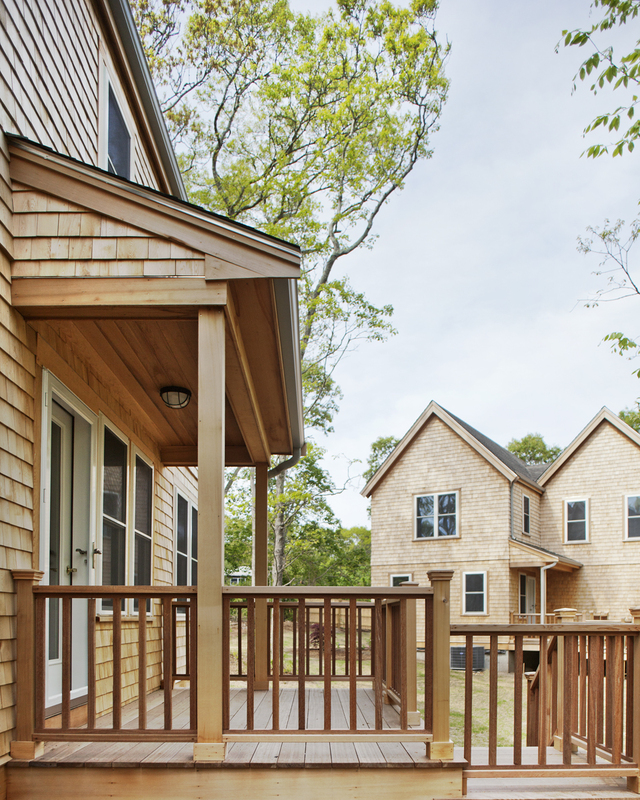 The Trust contracted South Mountain Company of West Tisbury to design and build a pocket neighborhood of 8 single-family houses within a 3.5-acre building envelope on 8-acres. 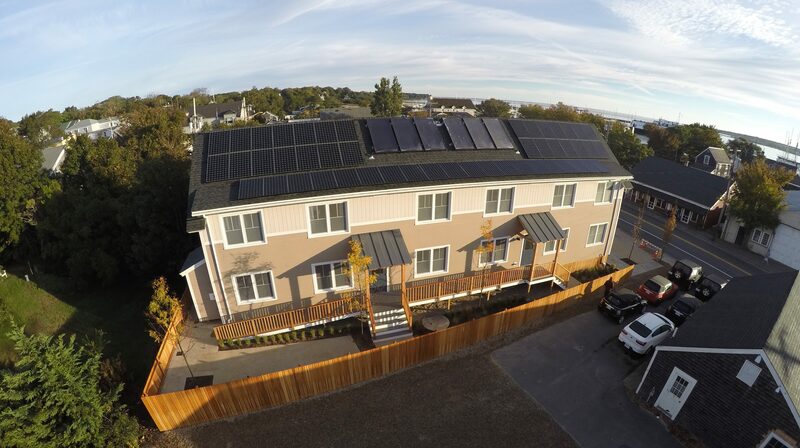 These eco-friendly houses were designed with high performance building standards, and Cape Light Compact funded solar electric systems enabled these LEED platinum certified houses to approach net-zero energy (using as much energy as they produce). One of houses was built by Habitat for Humanity of Martha’s Vineyard with a Habitat family and volunteers. The Trust worked with the Town of West Tisbury and the Dukes County Regional Housing Authority to select income-qualify households through a lottery. The eight houses were sold and the land ground leased with resale restrictions to income-qualified households earning 80%, 100%, and 120% or less of the median income in the spring of 2010. Grants were secured from the Island Affordable Housing Fund and the Town of West Tisbury Community Preservation Act (CPA) to help fund construction costs, and Cape Light Compact for high performance construction and solar electric PV panels. 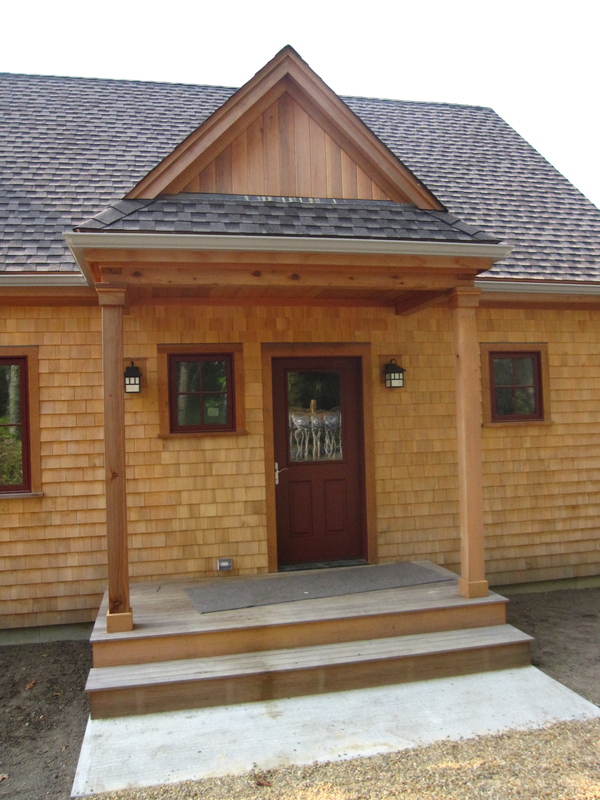 Construction financing was secured from the Martha’s Vineyard Savings Bank. Photographs taken of the construction process can be view at Eliakims Way photographs. An article entitled Partnering Housing and Open Space on Eliakims Way was recently published by the Martha’s Vineyard Magazine, and an energy performance report entitled Zero-Net Possible? Yes? has been published by South Mountain Company after the first year of occupancy. A public/ private partnership involving the Island Housing Trust who purchased a 3-acre parcel of land from the Town of Tisbury at cost, after the Tisbury Affordable Housing Committee secured a comprehensive permit to build a cluster of 4 single-family houses within a building envelope that will preserve half of the property’s natural wooded surroundings. The houses were designed by Sullivan O’Connor Architects of Oak Bluffs and built by Gino Mazzaferro, ICMC of Vineyard Haven to the Trust’s high performance building standards (Energy Star Plus) to ensure energy efficiency and long term affordability. Grants were secured from the Tisbury Community Preservation Act (CPA) and the Tisbury Affordable Housing Fund to help fund construction costs. Construction financing was secured from the Edgartown National Bank. The houses were completed and sold in September 2010 to income-qualified homebuyers earning 80%, 100%, and 120% or less of the median income. The Trust worked with the Dukes County Regional Housing Authority and the Tisbury Affordable Housing Committee to conduct the homebuyer selection and lottery process. Photographs can be view at Lamberts Cove photographs. The Island Housing Trust purchased an in-town 2.53-acre property in Edgartown and 9 affordable single family houses from the Island Affordable Housing Fund, the developer, in the summer of 2008. 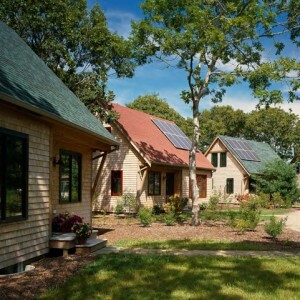 This pocket neighborhood was built to high performance building standards by South Mountain Company of West Tisbury and 4 of the houses with solar electric systems were certified and awarded the highest green building standards (LEED Platinum) in the country. The Martha’s Vineyard Savings Bank provided construction financing. In collaboration with the Town of Edgartown and the Dukes County Regional Housing Authority, income-qualified households were selected through a lottery. The 9 single family houses were sold and the land ground leased with resale restrictions to income qualified households earning 80%, 100%, 120% and 140% or less of the area median income. Grants from the Island Affordable Housing Fund, the Town of Edgartown Community Preservation Act (CPA), and Cape Light Compact helped fund the land purchase and construction costs. Photographs taken of the construction process can be view at Jenney Way photographs.